At eWedding post dates, directions, RSVP, registries and more. Upload unlimited photos and make changes around the clock. Even change the theme of your website as often as you like. Look to 58coupons.com for the newest coupons, discounts and promotions. Enjoy the $30 savings on the platium annual package, click eweddings.com for details. Start your free wedding site now and use services provided in the 2 week upgrade to the popular gold package - impress with a wedding site for photos, rsvp and more at ewedding.com. 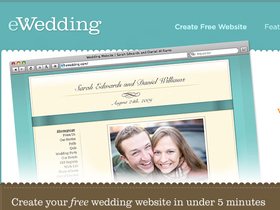 Claim your free wedding keepsake gift for creating a website with an annual package at ewedding.com. Order any 1 year package and get two months free at ewedding.com. Click to get started.